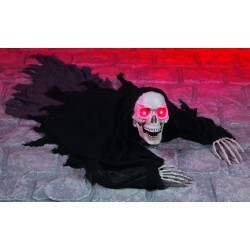 Spook your halloween party guests and trick or treaters with our Crawling Bride Ground Breaker halloween horror prop. The shoulders move up and down on this creepy cadaver and really gives the illusion that she is crawling! Battery operated she also makes unnerving sounds and has flashing red light-up eyes. Position her to look like she is coming out of a grave in your front garden or crawling from a partially closed door. You can position her arms at different angles to suit the setting. The Crawling Bride Ground Breaker halloween horror prop measures 1 metre in length. Why not pair her up with our Crawling Groom Ground Breaker!